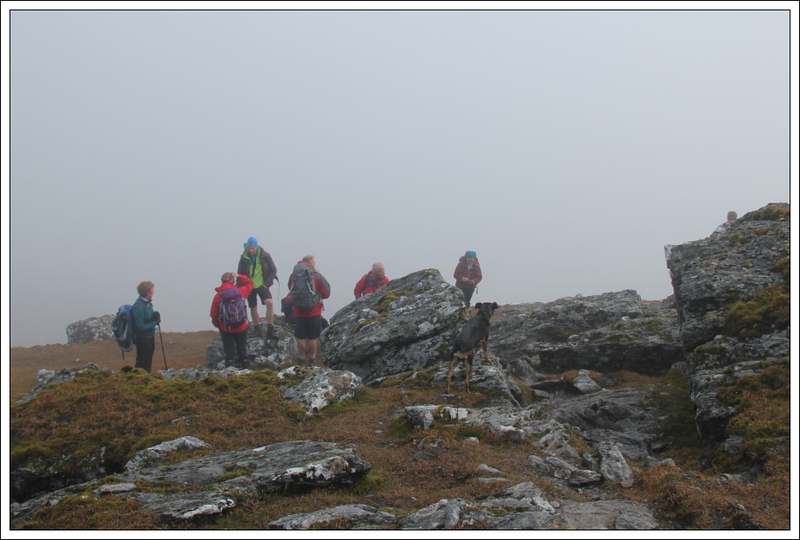 Yesterday I had the pleasure of accompanying twenty-three MMC members, and Penny (the Wonder Dog), up Stob Binnein and Ben More. This was to be a special walk in a number of ways. 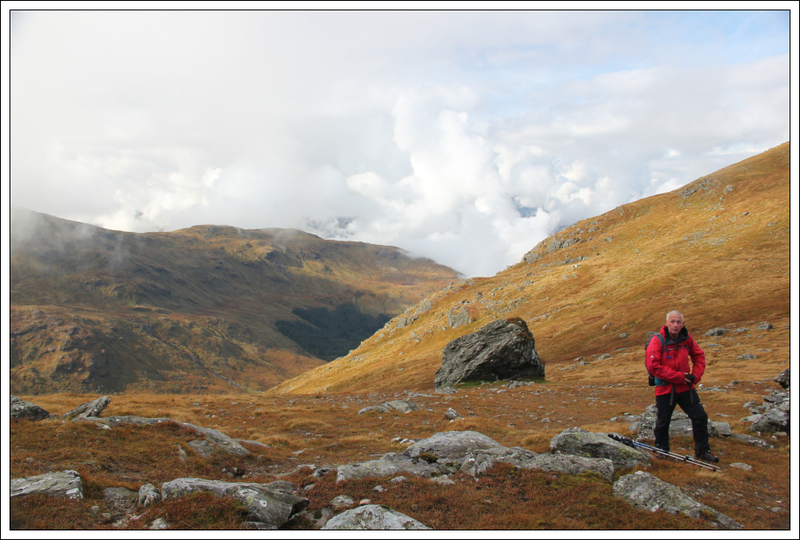 As well as walking in the company of a great bunch of friends this was to be Graeme's final Munro (3rd round) and Penny (the Wonder Dog)'s final Munro (1st round). Nine of the company are Munroists. 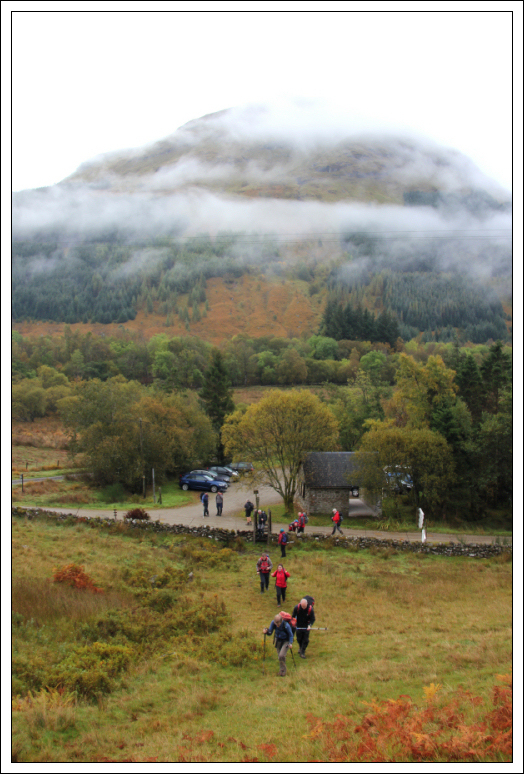 Also instead of a straight up and down from Ben More farm, cars were arranged to allow everyone to undertake a traverse from Inverlochlarig to Crianlarich. Many thanks to all the drivers who enabled this traverse. 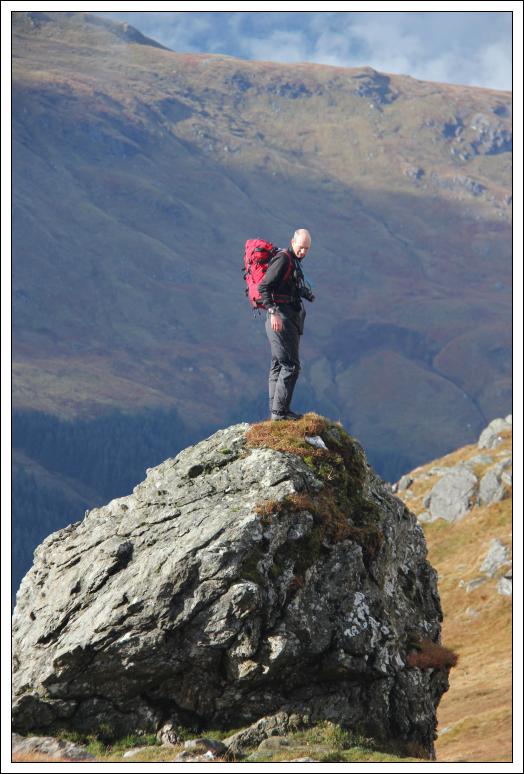 If Carlsberg made Mountaineering Clubs, I reckon it would have made the MMC - "Probably the best Mountaineering Club in the world!". 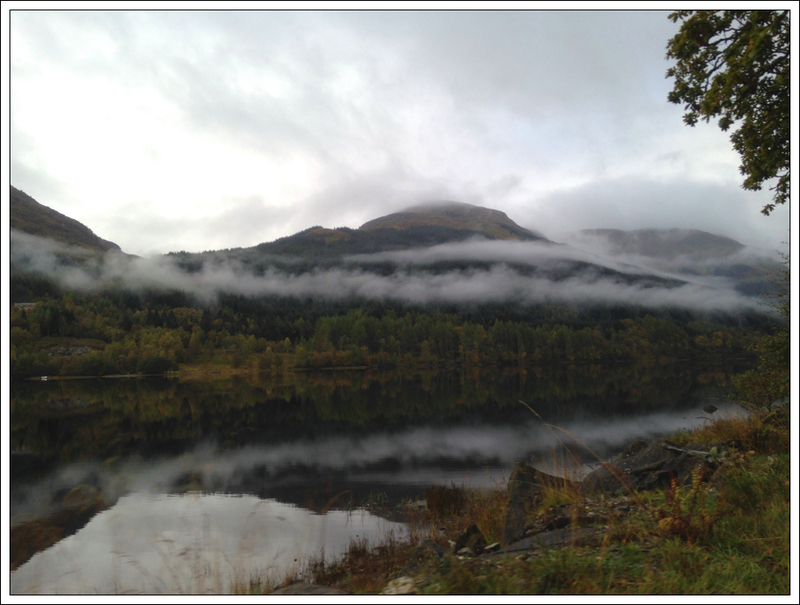 En-route to Inverlochlarig we were treated to beautiful autumnal reflections on Loch Voil. 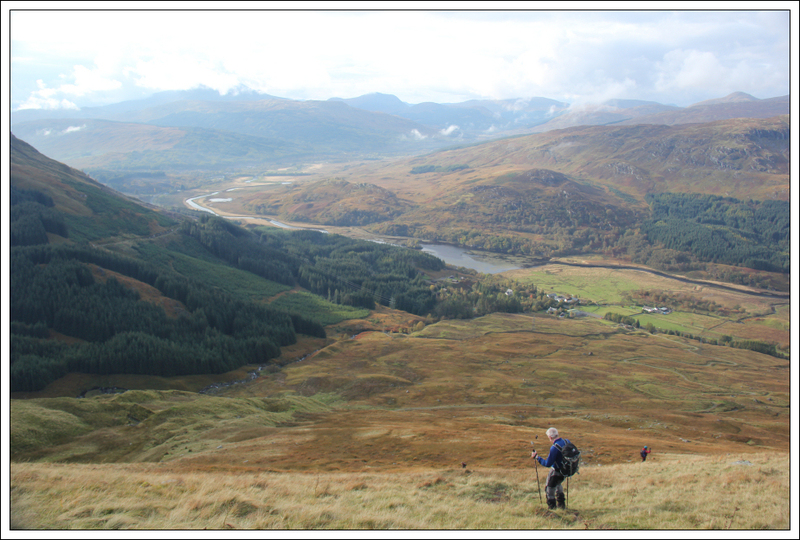 On arriving at the Inverlochlarig car park, after getting suited and booted we all proceeded over the stile to begin our ascent of Stob Invercarnaig. 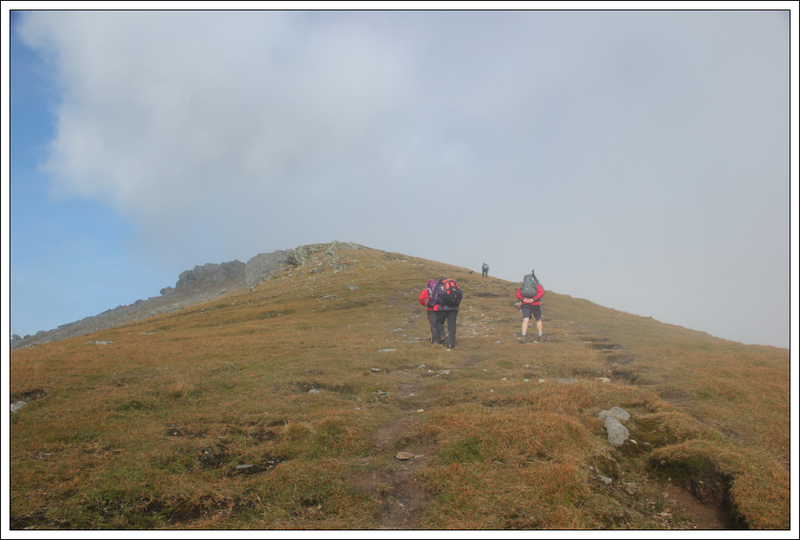 The initial c.500m of ascent was fairly steep. 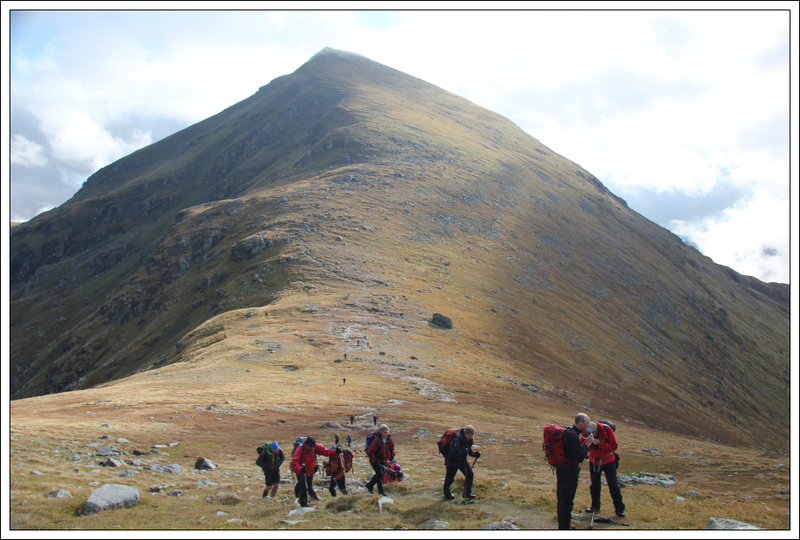 While the ascent was hard-going, it was a pleasant ascent compared with what we would have experienced had we set off from Ben More farm. 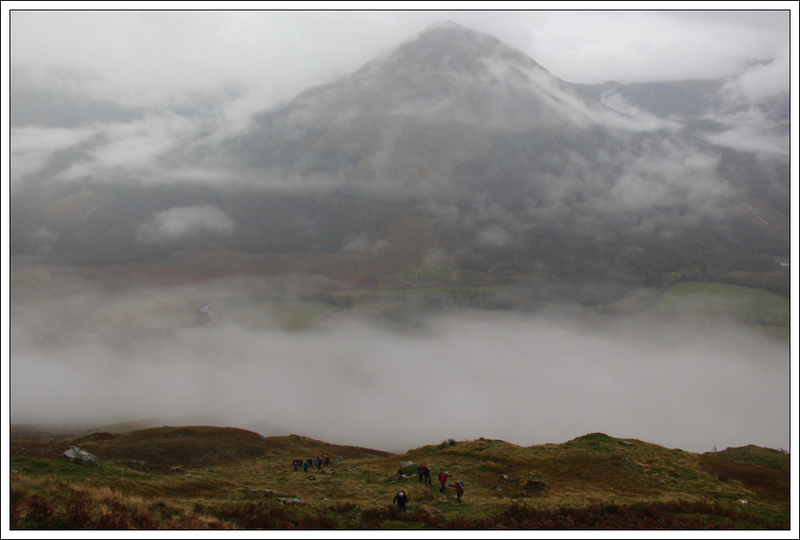 Views were however disappointing owing to low cloud. 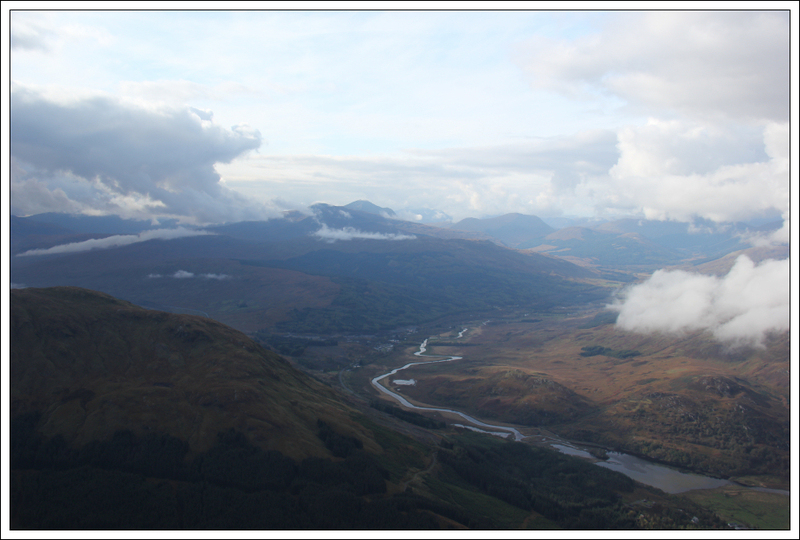 Hopefully the cloud would lift as the day progressed. 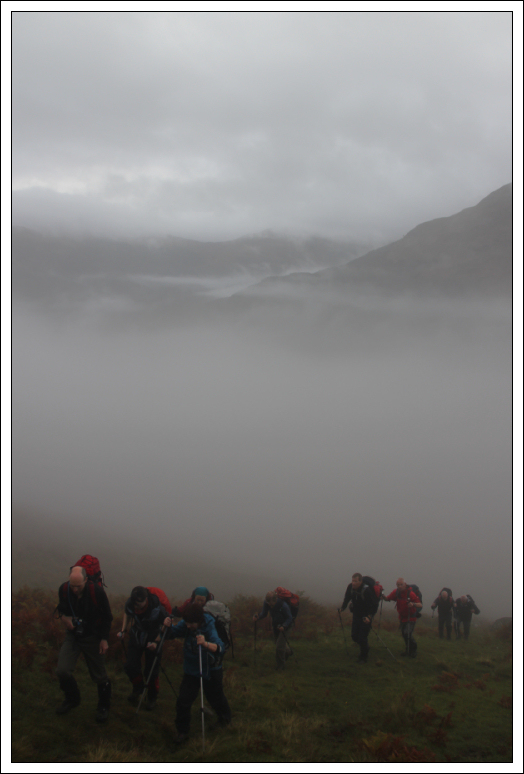 During the initial 500m of ascent, the group naturally split into several different speeds. 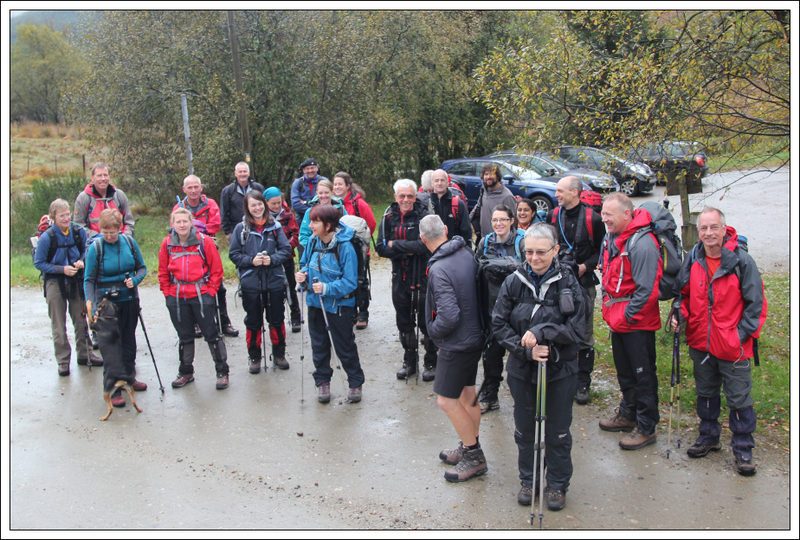 It was nice to chat with numerous members on the way up. Despite having a cold, I somehow managed to progress up towards the front however there was no catching Natacha . Respect! 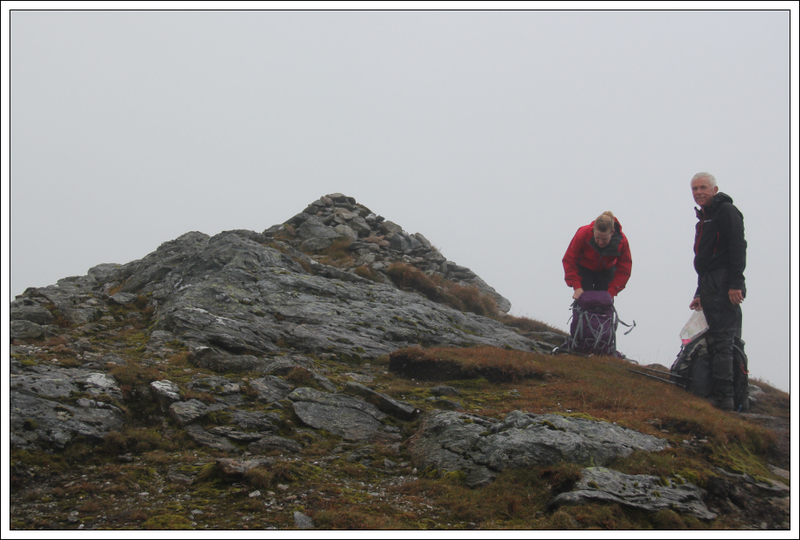 From Stob Invercarnaig to Stob Coire an Lochain I walked in the company of Rachel and Malcolm. 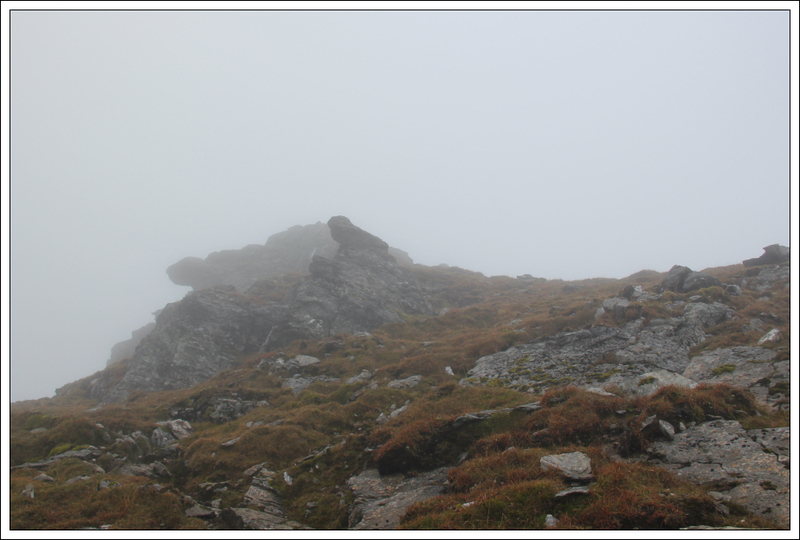 As we approached the summit of Stob Coire an Lochain, I could see the cloud was starting to dissipate in places. 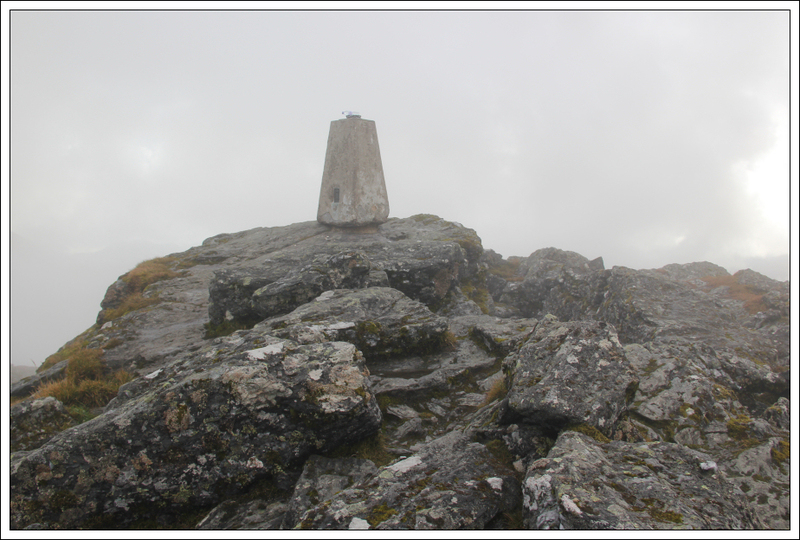 At the summit of Stob Coire an Lochain, I got the map out and pondered venturing over to also ascend Meall na Dige (another Munro Top). 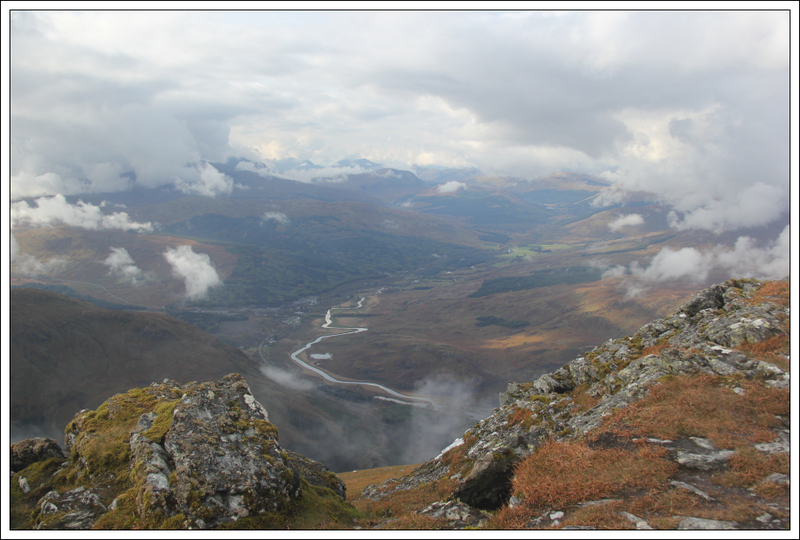 However, what I could see of the descent looked steep and it looked a bit of a trek out and back. 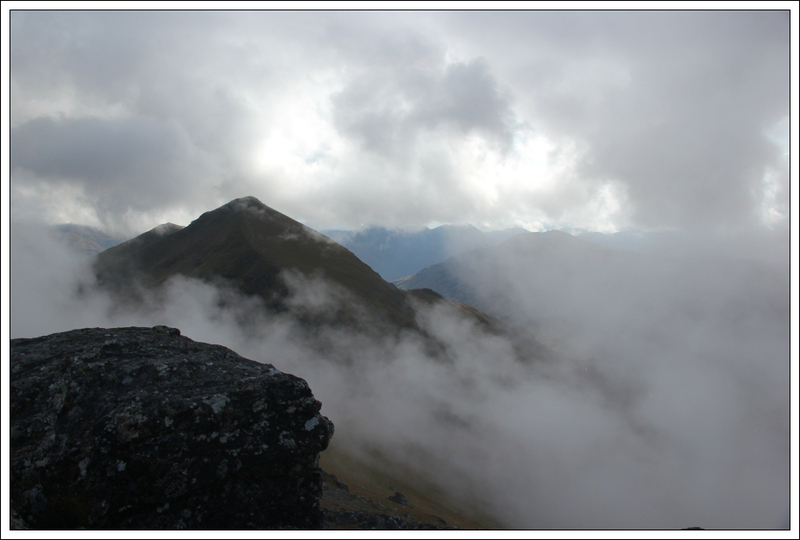 As I didn't want to miss summit celebrations, I decided to leave it for another day (possibly in a circuit with The Stob). 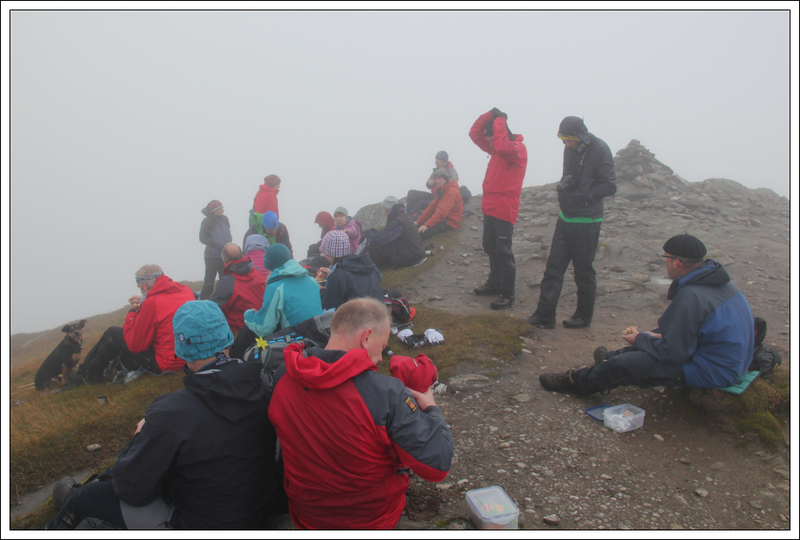 On reaching the summit of Stob Binnein we all stopped for a bite to eat and drink whilst allowing everyone to re-group. Despite putting on all my layers I still felt really cold. Winter is definitely on its way. 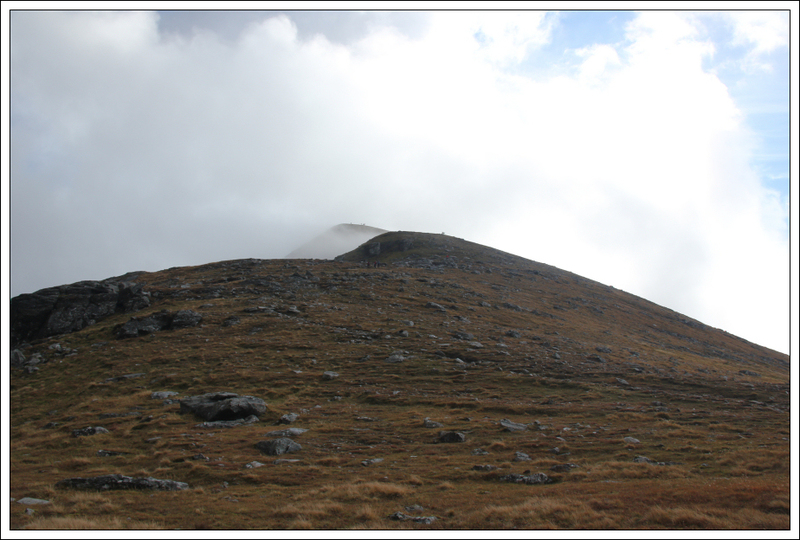 During the descent to Bealach-eadar-dha Bheinn we passed numerous walkers who were undertaking an out-and-back from Ben More farm. 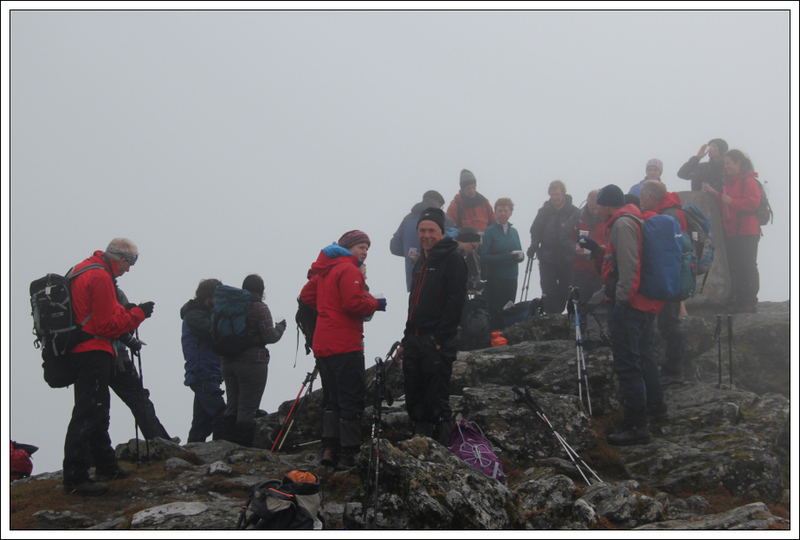 On reaching the bealach, we again stopped to allow everyone to re-group. It was much warmer waiting at the bealach. Whilst waiting both myself and Dan scrambled up the large boulder. 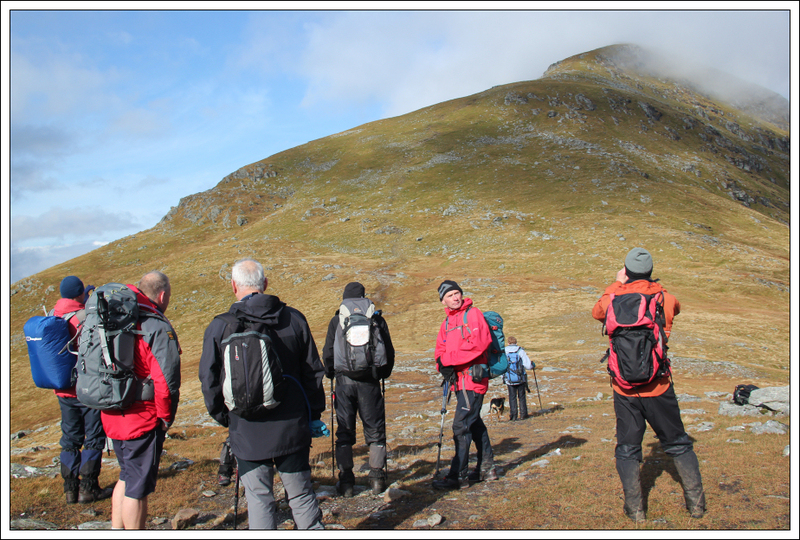 Having lost circa 300m descending Stob Binnein, we now all had 300m+ ascent ahead to attain the summit of Ben More. 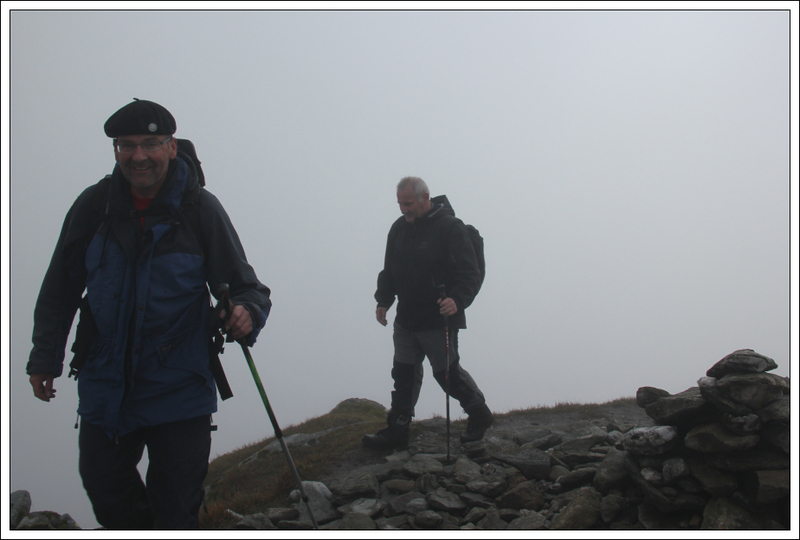 Thanks to Dave for keeping me company during the ascent. 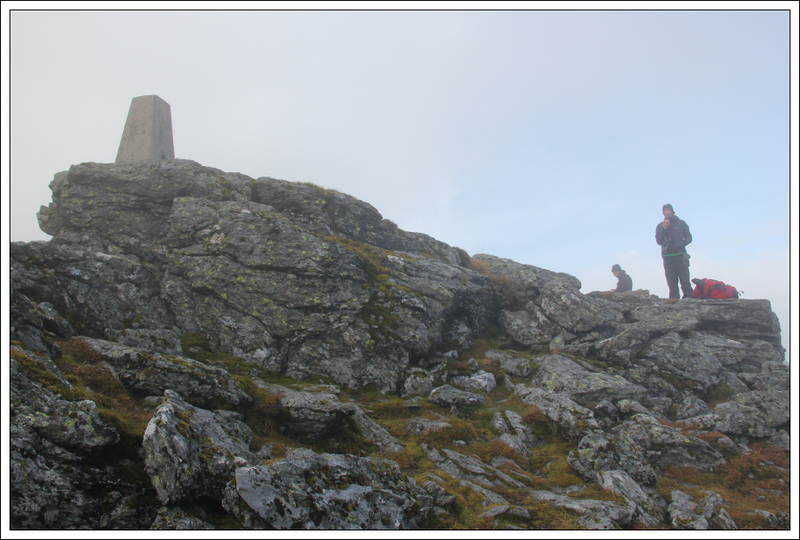 On reaching the summit, I waited with Dan and Malcolm for the large group to arrive. The MMC had a dog bowl specially engraved for Penny. "Penny (the Wonder Dog). Munroist. 11 October 2014." 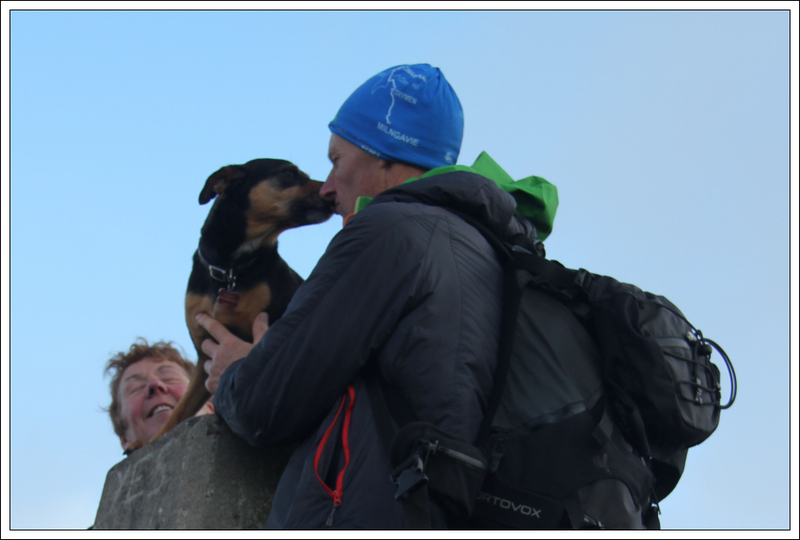 On arriving at the summit everyone congratulated Graeme and Penny. 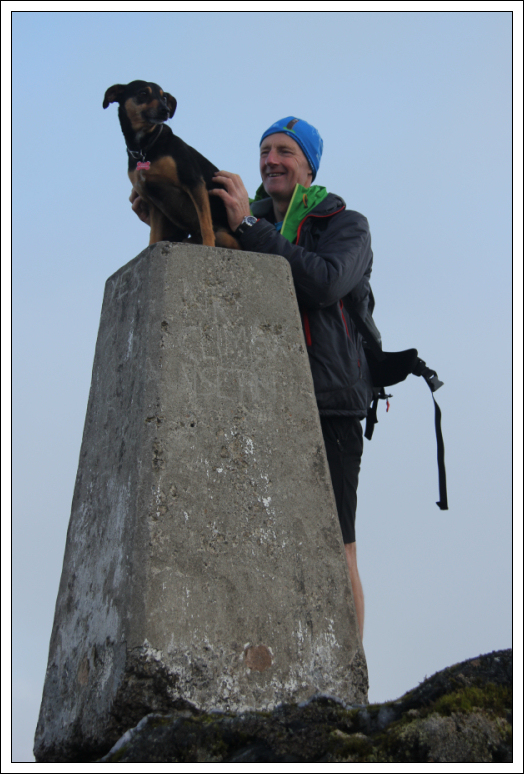 A fantastic double-achievement - Graeme completing his third round of Munros and Penny (the Wonder Dog) completing her first round. 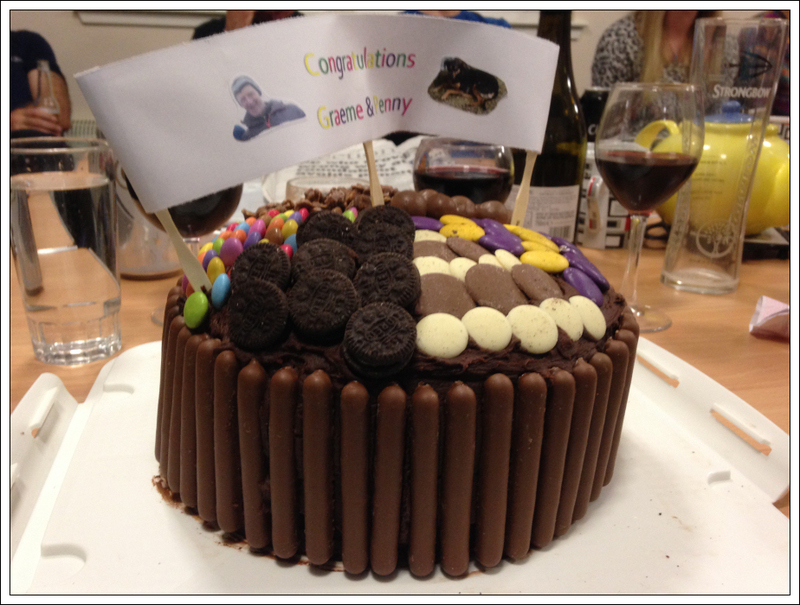 Champagne, Tablet and Millionaire's Shortbread were all well-appreciated at the summit. 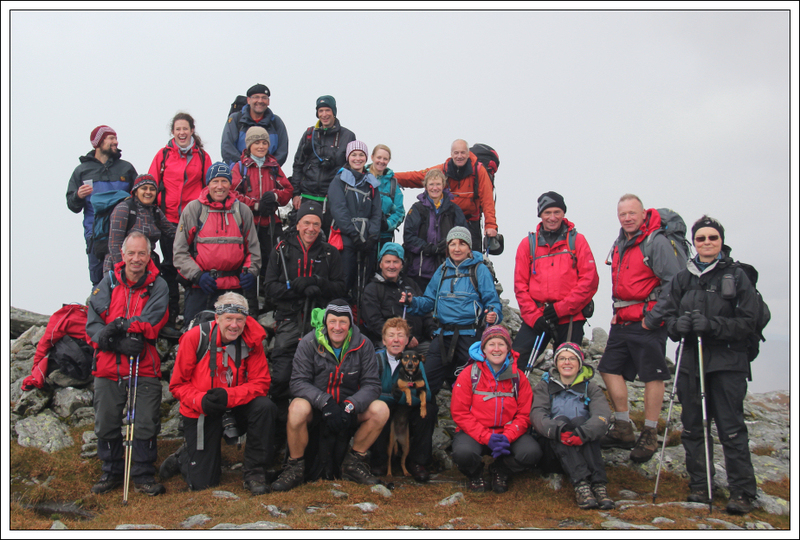 We then all progressed over to the cairn for a summit group photo. 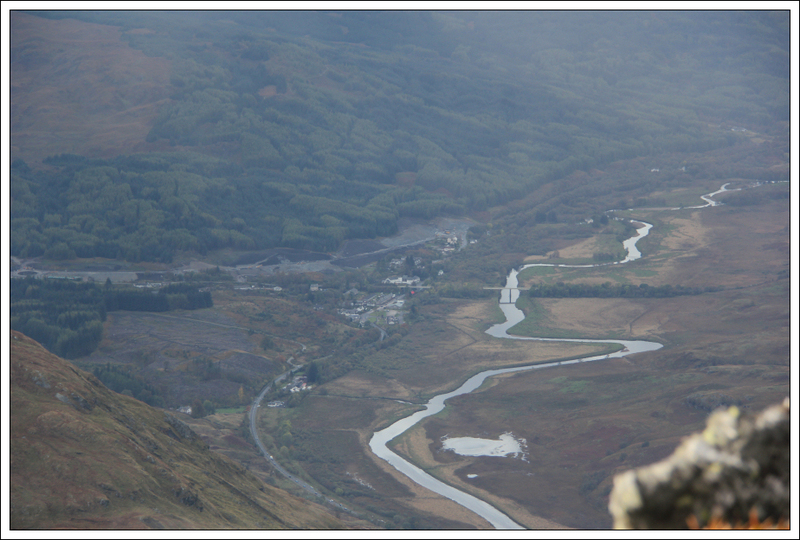 The car drivers set off ahead making fast progress down the hillside in order to drive back round to Inverlochlarig to collect cars. The rest of us descended at a more leisurely pace. 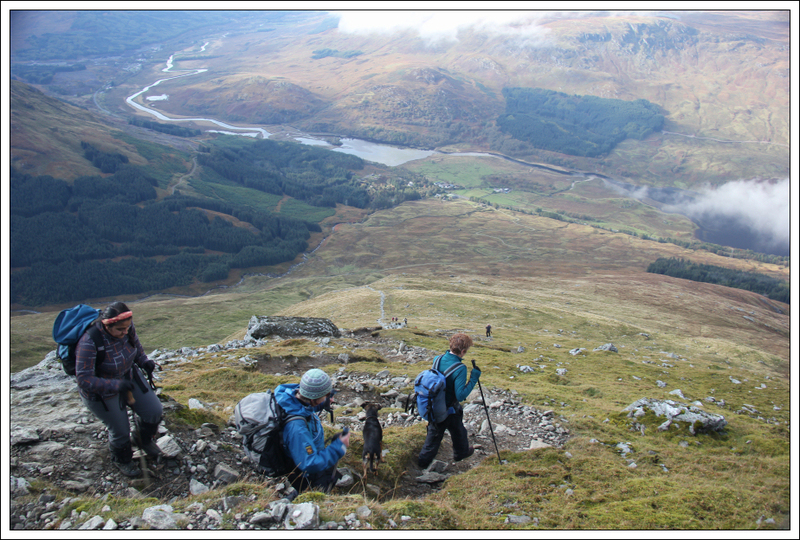 The descent was as steep as I remembered from my previous ascent of these hills in August 2000. 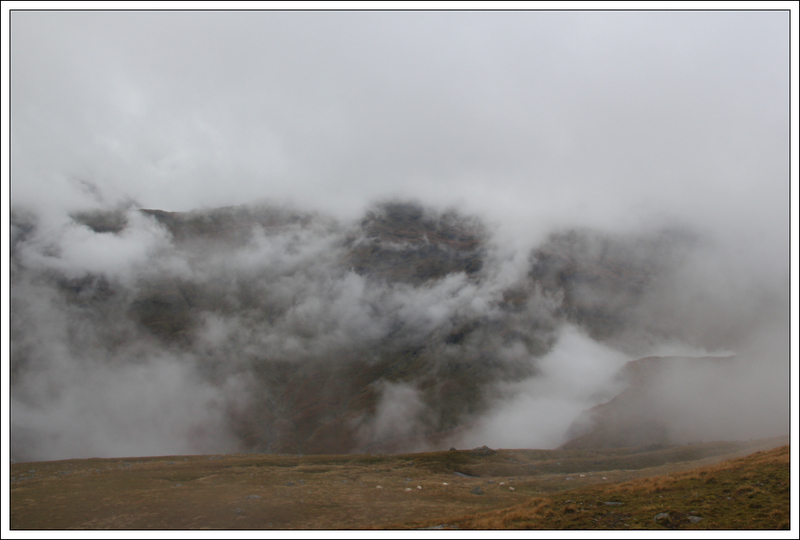 The underfoot terrain was much wetter and more eroded than in 2000. 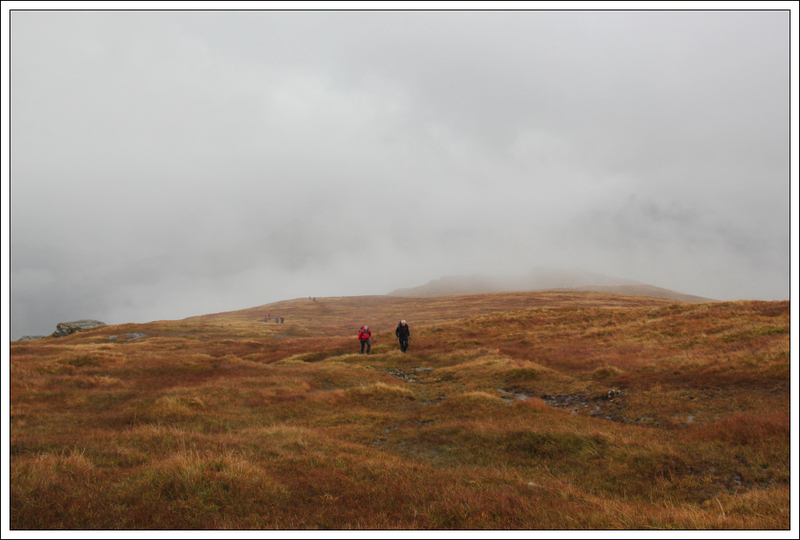 On reaching the road, we walked back to our base(s) - the Ochils Hut and Ben More Lodge in Crianlarich. 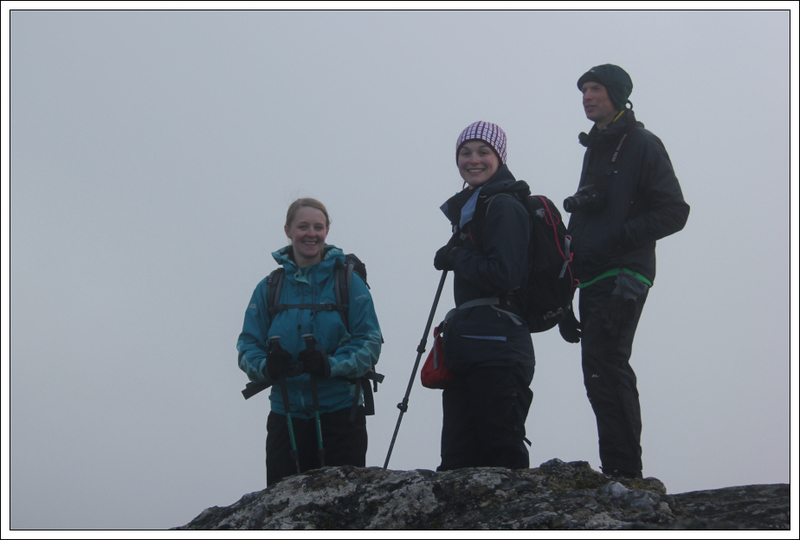 The hillwalk was only the start of what turned out to be a great day. 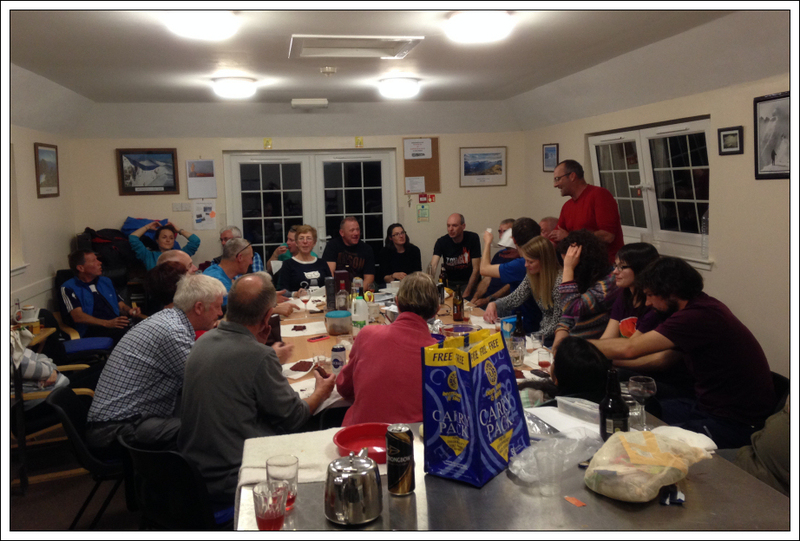 The evening celebrations were also superb including sampling Sloe Gin, Sloe Vodka and 25 Year-old Cask Strength Whisky! Jake entertained the company performing a song he had written especially for "Zippy Morrison" and Rachel provided the most superb cake made by her very own hands. A club of many talents. 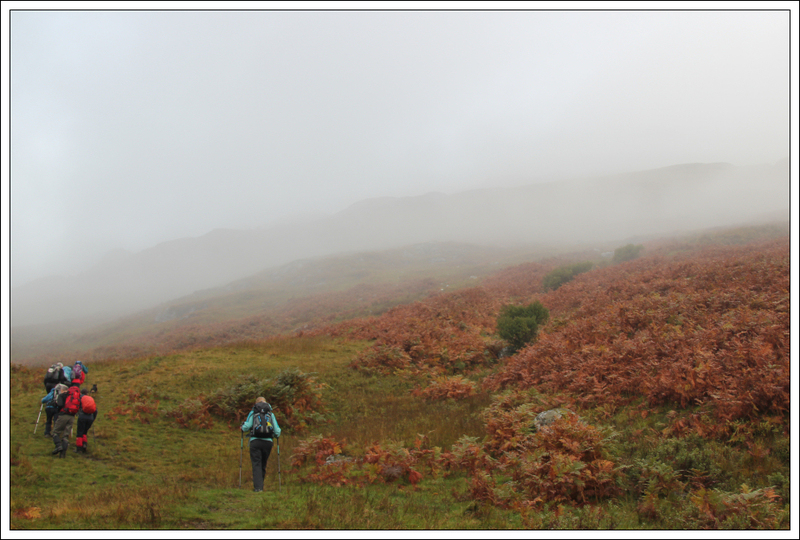 Possibly my favourite walk this year. Well done Graeme and Penny .